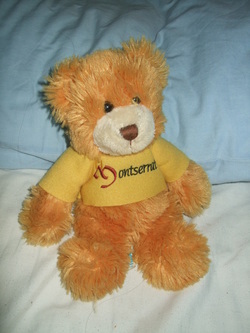 Hello there, I am Monty, I'm a teddy bear and a travelling bear (or traveling bear to my American cousins!) Although I was born in the Montserrat mountains near Barcelona, I quickly decided that a life of travelling was the life for me. I am now resident in London and use it as my base to explore the world. I go travelling anywhere that I think might be interesting, as you will see from my photos, I get up to quite a lot of exciting activities when I do get away. I have a particular like for tea and coffee but am open to any new travel experiences that come my way. I was born in a Monastary, being raised by monks and from a very young age I seemed to have the travel bug. I would look at all the people from foreign lands come to Montserrat and I would wonder what those people did in their own countries. Sometimes I even saw other teddy bears and some may actually have been other travelling bears! Despite just being a small teddy bear I have gone on to experience some wonderful adventures, like the wilds of the Isle of Wight and the Teutonic splendour of Berlin. Over these pages I have decided to describe some of my journeys and hope that other, similar bears will be inspired to become travelling bears and start on journeys themselves and perhaps even write their own travel blog. On the following pages I have listed the places I have travelled to - I will update this whenever I go somewhere new! Another page shows some of my friends and some famous travelling bears. I also have a page so you can contact me and a page that contains links to other bears or things of interest I have found on the internet and I think you will find interesting too. I hope you like my website and if you do (or if you don't), or if you have anything interesting to say about a little travelling bear like me, I'd like to hear from you!